Grazzia Sagastume is a Honduran-American violist and violinist. She began her musical education on the viola at age 13 in the “Escuela de Música Victoriano López” in her home city, San Pedro Sula, with Maestro Mario Alejandro Torres. She completed her Bachelor of Arts in Music at Western Illinois University studying viola with Dr. István Szabó and chamber music with Dr. Richard Hughey. While attending WIU she was awarded a full scholarship, performed in the prestigious “President’s International String Quartet”, and was a member of the Quincy Symphony Orchestra. Ms. Grazzia then graduated from the University of New Mexico in Albuquerque with a Master in Music with dual concentrations in Viola Performance and String Pedagogy. While in New Mexico, she studied viola and violin with Susan Kempter, Kimberly Fredenburgh and Carmelo de los Santos. In her capacity as graduate assistant, she was actively performing chamber music with the “Abe Franck Graduate String Quartet” and UNM’s New Music Ensemble. 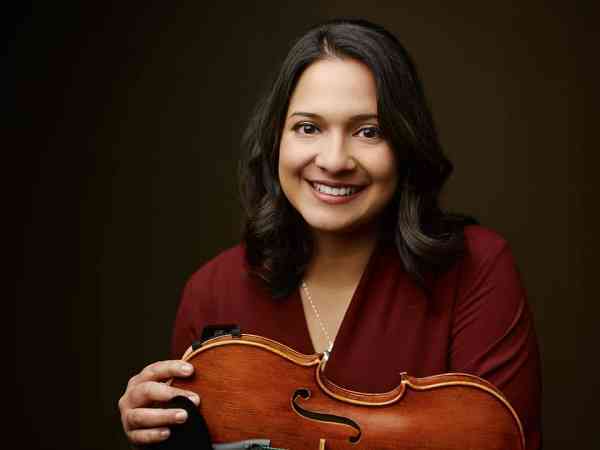 She also performed professionally with New Mexico Philharmonic, Santa Fe Symphony, Performance Santa Fe Symphony, and San Juan Symphony in Durango, CO. Also an active teacher, Ms. Grazzia taught at the Young Musician’s Initiative (El Sistema Albuquerque), the UNM Lab School (Suzuki), and mantained a private studio. While in Albuquerque, she also completed training in all Suzuki violin books 1-10 with nationally renowned pedagogue, Susan Kempter. Ms. Grazzia is a member of the Suzuki Association of the Americas, the American String Teachers Association, and the Omaha Musician’s Union. Since moving to Omaha, Ms. Grazzia has been teaching diligently as lead teacher with the String Sprouts program. Teaching private violin and viola lessons at Omaha Conservatory of Music, violin group classes, music theory classes as a Faculty Artist, and coaching chamber music with the Omaha Area Youth Orchestras. She has performed with Omaha Symphony, Mannheim Steamroller, Voices of Omaha, Orchestra Omaha, and as a local with the Omaha Performing Arts’ Broadway tour shows ”Cinderella” and “Phantom of the Opera”. This summer 2017, Ms. Grazzia attended the Retreat for Violin and Viola teachers at Indiana University. This was an intensive String Academy pedagogy workshop where she studied with prominent US pedagogues Mimi Zweig, Rebecca Henry, Brenda Brenner, Sherry Sinift, James Przygocki, and Elizabeth Zempel. In her spare time, Ms Grazzia enjoys cooking, baking, running, reading, listening to Brazilian music, and savoring a warm cup of tea or coffee!